Great news! In honor of the Kickstarter for the second edition of Bulletproof Blues (starting February 1, 2014), the British Library will be staging an exhibition of comics! 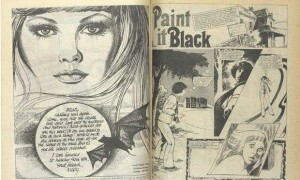 Boys in the late 1970s probably assumed the girls comic Misty was all boring romance, puppies and ponies. How wrong they were. They were full of “incredibly dark, weird, psychologically harrowing” stories with “trippy and odd” artwork, said John Harris Dunning. Dunning is co-curator, with Paul Gravett, of what will be the UK’s biggest exhibition of British comics, taking in everything from newly discovered Victorian comics to modern classics such as V for Vendetta. The summer show, entitled Comics Unmasked: Art and Anarchy in the UK, is being staged by the British Library which holds the complete output of the British comics industry but said it had not in the past done the genre justice. The exhibition will have sedition and rebellion at its heart, said Dunning. It will also aim to explode a few myths, not least that the publications are all about superheroes and that reading them is the pastime of boys, he added. The show will explore the full gamut, from mainstream to underground.